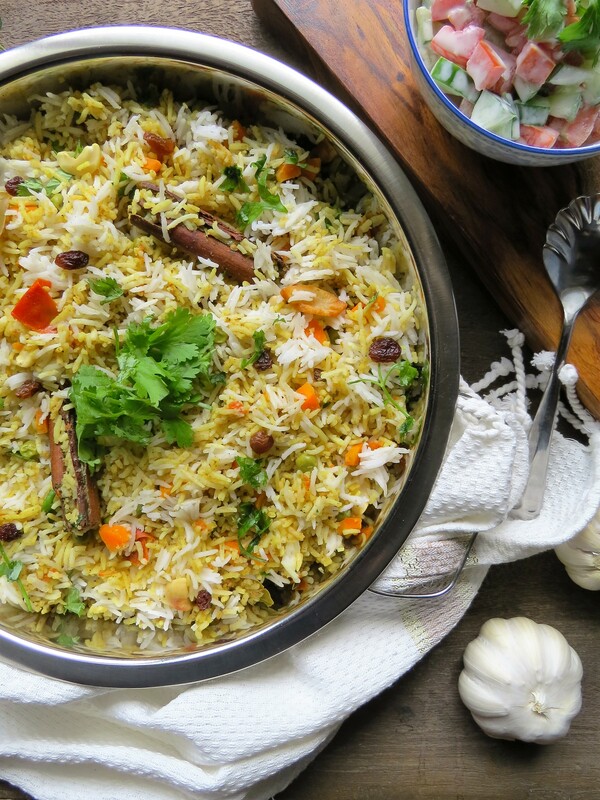 With Tamil New Year almost upon us I thought I would share my recipe for vegetable biryani. 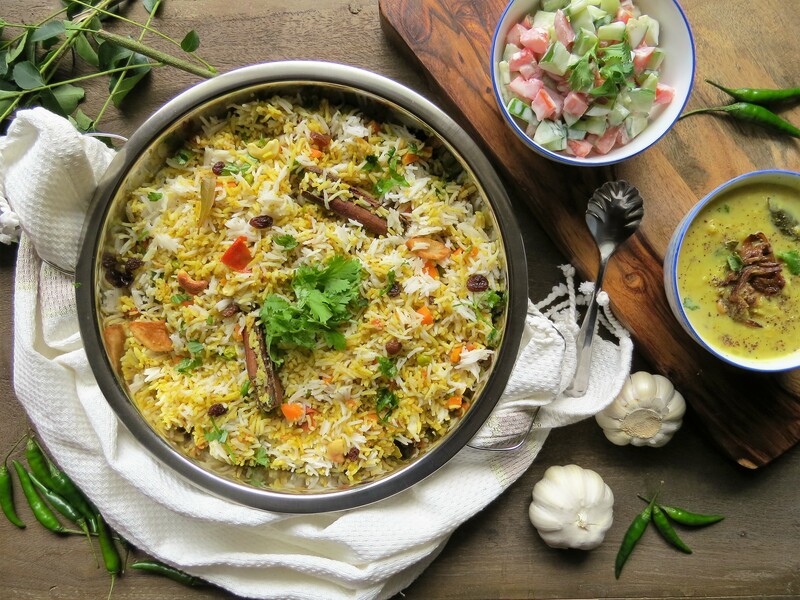 This aromatic and flavourful rice dish usually accompanies holidays such as Tamil New Year and Diwali as well as birthdays, family gatherings, and special dinners. 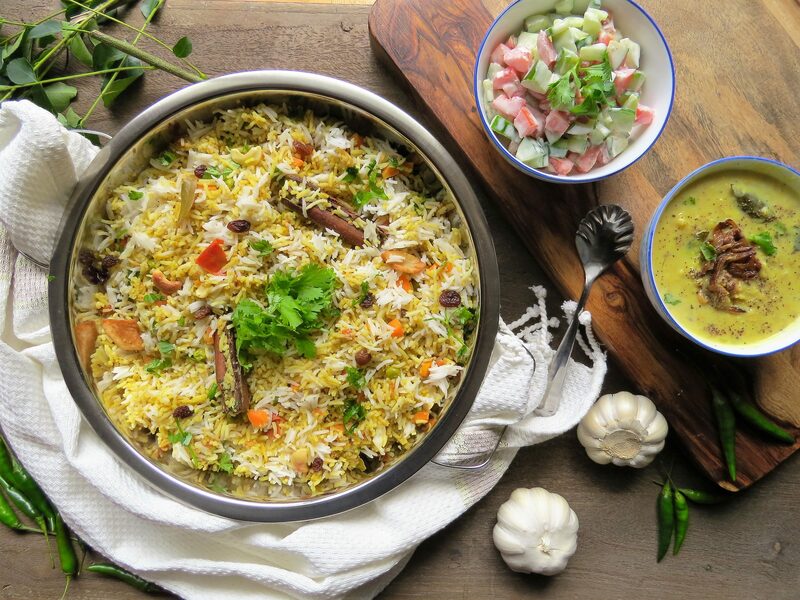 As with any biryani you make at home from scratch, you can expect a long list of ingredients and some prep time but the results are completely worth every effort to prepare this dish. Although traditionally biryani is cooked on low-heat in a biryani vessel, I cook mine in my rice cooker and it turns out just fine. Wash the basmati rice in cold water and then drain. Set aside in the rice cooker container. Heat the oil and ghee in a large skillet on medium heat. Temper the cloves, cardamom, cinnamon, and bay leaves. Add the ginger and garlic paste. Cook until fragrant, about a minute. Add the tomatoes, and cook until tomatoes are soft. Use a wooden spoon to break up the tomatoes. Cook until most of the liquid evaporates. Add the coriander leaves, mint leaves, and green chilli if using. Sauté for two minutes before adding the yogurt. Add the garam masala, red chilli powder, cumin powder, and turmeric powder. Cook until a rich and very thick gravy forms and the oil starts to separate from the gravy. Mix the contents of the skillet with the rice in the rice cooker. Add the cold water, coconut milk, carrot, peas, and salt to taste. Cover and let cook until done. Once the rice is done, open the lid and let the steam out. Wait twenty minutes before fluffing with a fork. Before serving, garnish with coriander leaves, toasted cashews and raisins. To temper, means to cook the spices until you hear a sputter. I like to garnish my vegetable biryani with fresh coriander, raisins, cashews, as well as fried potato. I also mix in a cup of cooked plain basmati rice just because I love the white rice in contrast with the biryani rice. 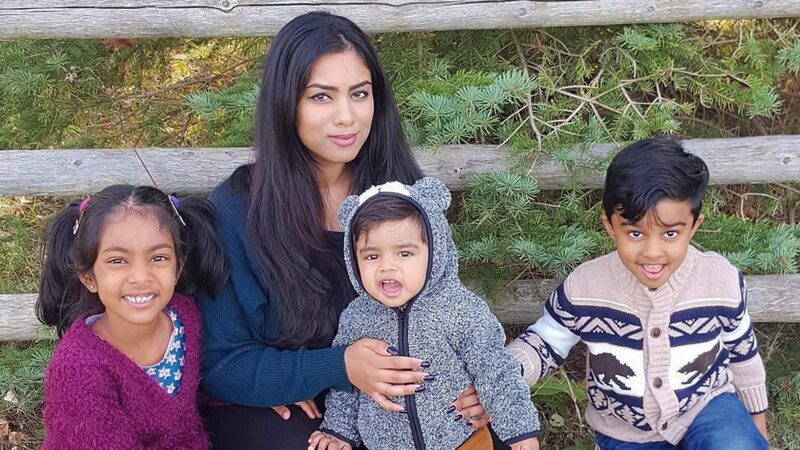 I typically use a 2:3 ratio of rice to water for the brand of basmati rice I use, although some brands may require slightly more water for that amount of rice. If you typically use more water, keep in mind that the rice will also cook in the liquid of the gravy, before adding more. Serve with an hard-boiled egg, ratia (yogurt dip with cucumbers, tomatoes, and onions), and curries of your choosing. If you liked this recipe, you may also like my recipe for Chicken Biryani. If you make pongal for Tamil New Year, you can find my recipe for sweet pongal here.